INSTAR is the scientific word for the transformational growth periods between molts in the metamorphosis of the larva into the monarch butterfly. 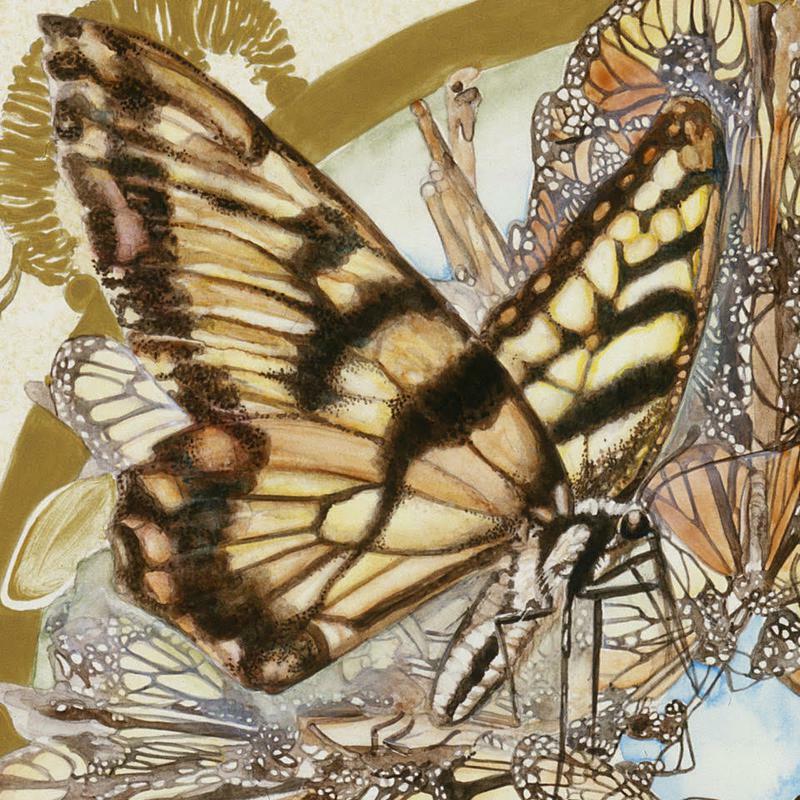 The chrysalis and the butterfly are universal symbols of transformation and hope. We are all INSTARS in the process of evolution and transformational growth. THE FULL BODY ELIXIR becomes your faithful INSTAR when practiced regularly. It’s wonderful to have something we can rely on in good times and in times of challenge. the caterpillar expands so much that it must shake off its thick, old skin. 3. To set with stars, to make a star of. 4. Any evolving Being in a conscious, transformational growth period toward one’s essential and pure nature. 5. Shaking off the past. (Webster and O’Neill). What you will be is what you do now. If you want to know your past life, look into your present condition. Look at your present actions. THE MAGIC OF METAMORPHOSIS: I had been wishing for a name for this practice that I do for quite a length of time. One day I was walking into a butterfly house in Washington DC with my dear friend Savana Moore, the composer for The Instar Meditation CD. Savana is a very special musician who is guided by a host of Angels. I was struck by one word - Instar in a lengthy poster describing the life cycle of a monarch butterfly. Somehow Instar jumped off the board right into my mind’s eye. I recognized it instantly. What a gift. Instar is not the actual molt of the butterfly’s skins. Instars are the periods of growth between molts in the process of metamorphosis. Around the world, the monarch is considered the ultimate symbol of transformation. 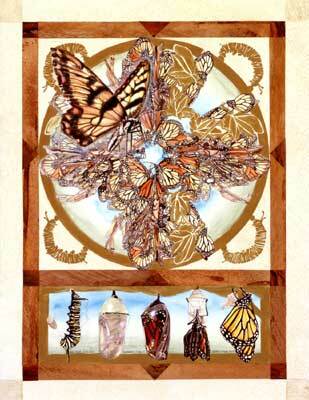 The monarch’s story bears telling both as a visualization meditation and a metaphor for life. For this reason I chose the monarch as a symbol for this series of practices, and painted them for the DVD and CD covers. The print is available from Instar Yoga). A 1/25-inch long, 16-legged caterpillar wriggles free from a tiny egg, devouring its protein rich eggshell. Caterpillars are complex and interesting creatures carrying within them a primitive brain, nervous system and the amazing gooey cells that create the adult butterfly. They are very active and able to survive in a hostile world of predators. Within a few hours of its birth, the caterpillar begins to eat. After three days of eating, growing, eating, resting and more growing, it is ready to burst out of its tough, waterproof skin (cuticle). After alternately shaking, pushing, taking in air, pumping blood and resting - for three hours - pfewf! Then the skin splits wide open below its head all the way down its back freeing the caterpillar from its limiting old shell. This dynamic process repeats three times more, each time revealing a larger more elastic, more colorful, more beautiful black, bright white and yellow skin which “ripens” in the sun and air. Each molt is a struggle that brings dramatic change and evolution in the caterpillar’s body. In just two weeks the caterpillar has multiplied its weight by more than 2,500 times (wow!). The fifth time, however, is the most remarkable. She spins a dense little mat of silk on her host milkweed stem and hangs down from it. After shaking off the “old” tight skin, the caterpillar mysteriously disappears, transmuting into a lovely hanging jade green lantern bedecked with stunning, metallic gold jewels. This is the chrysalis, which comes from the Greek word chrysos meaning gold. Inside the gooey, fleshy caterpillar cells are mystically transforming (pupation) into the beautifully patterned black and orange and white-flecked wings, which can be witnessed through the evolving transparency of the lantern. Ah, the magical Being within is revealing its transformation through the resilient clear vessel of the chrysalis. After 5 to 15 days, wisely dependent on the presence of a warm sunny day (monarchs can sense weather conditions from inside the chrysalis), a silvery frost spreads over the lantern - the sure sign that the body is separating from its shell. There’s a shake and a crack, and then the bursting forth of the still wet slender body and graceful wings of the monarch. Pumping blood from her big abdomen to her wings, her belly shrinks and her glorious wings expand, dry and strengthen into a 4” flat painted canvas shining in the sun. One powerful down stroke and the monarch takes flight. Monarchs that are born in late summer and autumn are the only butterflies whose migration is a round trip. They travel to Mexico from the US eastern seaboard and back again. It is amazing that these seemingly delicate creatures fly together thousands of miles across the continent to reach warmer wintering grounds. The monarch is a magnificent ancient symbol to inspire the conscious and wonderful transformation of the human into the Being! May we rest in knowing that all of our gooey “stuff” carries within it the exact seeds and precise conditions that we need for our metamorphosis home to love. It’s true. Every illness, every challenge, every situation we encounter gives us the exact prescription we need for the spiritual journey. The gooey things that ail us are the very gateways to finding our path home to love! What a gift! We are all INSTARS transforming into Being. Yoga, qigong and meditation are powerful gifts from teachers long, long ago to assist us in breathing and pumping and wriggling out of our limiting shells. Sweet joy! Trust that this practice has come into your life right now because of your readiness to create the space for Grace to transform you. It is your time now - the transcendent, timeless NOW in which you get to experience the Divine.